Paranormal Romance Reviews: I MET A DEMON by Petronela Ungureanu. 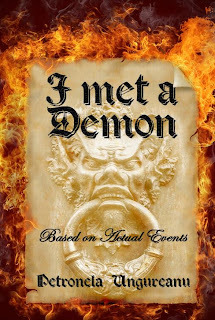 I MET A DEMON by Petronela Ungureanu. From Petronela Ungureanu, the author of short fantasy work LOST IN THE SEVEN WORLDS, comes a chilling piece of paranormal fiction, I MET A DEMON. The story isn't exactly contemporary, set some thirty plus years earlier, in Petronela's native Romania. It's a fictionalized account of a true story and written in the first person. While Petronela is writing in a male voice, from the phraseology one can discern that this is not an English, nor an American voice. Not even Australian. Yet this simply adds to the chilling quality of Petronela's writing. She is, after all, from Romania, a land which is famous for its horror stories - stories of werewolves and vampires. It's also a country which was ruled by a dictatorship which denied existence of the supernatural for quite some time in modern history. Yet the truth is, the supernatural dimension exists, no matter how much one may deny it. This short story had me so riveted that I have to tell you that the hairs literally stood up on the back of my neck. I haven't been so terrified in an age! So if you 'are a person who enjoys horror/paranormal fiction (or speculative fiction as it's called nowadays), you wouldn't be wrong to pick this one up. Petronela's talent doesn't lie in perfect grammar or spelling - these things vary from country to country in the English speaking world. It lies in her spellbinding writerly voice.